Sharing Memories: A Genealogy Journey (Week 30) – We’re Having a Heat Wave! This past week I joined the Google+ group and have connected with several genealogists, including Lorine McGinnis Schulze and her Olive Tree Genealogy blog. She has a writing prompt series she calls Sharing Memories: A Genealogy Journey and is now up to Week 30. I decided to join in this week on the topic of “We’re having a heat wave” and talk about the heat in my own childhood and youth. One of my first memories of the heat was the summer of 1947 or 1948 in Gainesville, Texas. I have always loved to read and that summer mother let me go to the library by myself. From having been back to Gainesville on a research trip, I know we must have lived about a mile from the library, which was downtown on California Street. I don’t specifically remember the library – what I remember was the trip home. I had obviously gone to the library in the morning and stayed there a long time because when I returned home it was clearly afternoon and HOT! I know that specifically because I was barefoot [a typical condition for me during the summer] and the concrete paving was, as has frequently been observed, “hot enough to fry an egg.” In response to that unexpected hot concrete, I attempted to find as many patches of grass as possible and leap from one patch of grass to another as I crossed streets and sidewalks on my way home. Another way the neighborhood children handled the heat that summer was with a metal washtub we filled with water from the outdoor faucet and we took turns sitting in it. We also got frequent drinks from that same outdoor faucet. 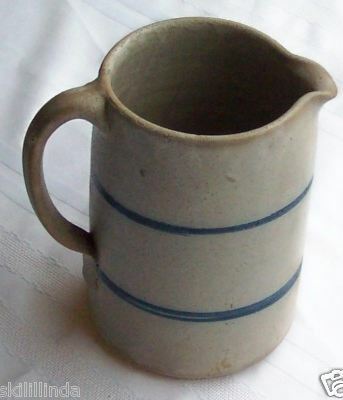 Sometime during the mid-1940s, Mother purchased what was, I’m sure, an inexpensive and heavy gray with blue stripes stoneware pitcher; during the summer she would occasionally make a pitcher of a mixture of really cold orange juice and lemonade and pour us a glass as a treat. I loved that pitcher and thanks to the Internet, I was able to find a picture of a similar one – wish I still had mother’s. By the summer of 1949, we were back in Oklahoma City. That summer was a part of the huge polio scare that was so predominant during the summers. Every parent insisted their children come inside and rest during the heat of the afternoon. Our rented house had a large screened-in back porch and one of those inside afternoons it was so hot, even on the shaded and screened porch, that I had the screen door open and was lying with my head outside on the first step hoping for any any breath of air. We lived less than a block away from the old Blackhawk Swimming Pool; I remember walking by and watching people swimming, but I don’t remember swimming there myself that summer (although it’s possible I did since I love to swim). We moved again the following year to a neighborhood that had a small park a few blocks away. It had a small wading pool and, although, I don’t remember being in it much, I did take my brother down there where he could play in the pool [he’s six years younger than I am and would have been about three to four at the time]. Water was definitely a factor in summer-time cooling strategies and it could be a real treat when someone’s parents would allow the neighborhood kids to play with the water hose with every kid getting a turn at both spraying and being sprayed. Summer in Oklahoma generally means a dearth of rainfall. Because our rain is generally part of a thunderstorm, which is usually accompanied by lightning, it’s not wise to be playing outside during the rain, but following an occasional late afternoon rain, one of my favorite things to do was go outside barefoot and splash through the water still standing against the curbs. Even the rainwater could still have some warmness to it because the streets would be hot, but wet skin picks up breezes so nicely. I was always fascinated with the earthworms that were so prevalent following the rain. Of course, you could find worms if you went digging in the dirt, but after a rainfall, there would be hundreds of them crawling on sidewalks and driveways and in the grass – amazing! I’ve seen pictures of old rotating fans, but I don’t remember having them during those years. We finally lived in a house that had a large window evaporative or swamp cooler by the time I was in my mid-teens. This was a large metal box affixed to an open window. It had fiber-type pads [they looked to me as if they were filled with straw] on the sides that we would hose down in the afternoon; there was also about an inch or so of water standing in the bottom of the metal box. There was a large metal ‘squirrel cage’ fan that turned through the water and blew water-cooled air through the window into the house. It definitely helped in reducing the house temperature but because it was coming through only one window, the portions of the house without direct access to that cooler air could remain quite warm. Sometimes during the nights, I would get so hot I would get up and go sleep on the floor in the dining room where the swamp cooler was located. Another way I sometimes cooled off at night was to take my bedding outside and sleep in the backyard. As the morning approached and the temperatures grew cooler, it could be quite pleasant sleeping with light covers on – until the time dew began falling in the mornings and you’d wake up with damp covers. 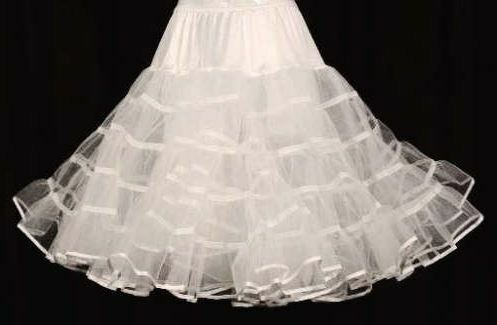 Although my typical fashion choice for home during the summers was shorts, a date night would mean a full skirt with starched net slips under them and often more than one of them to achieve the necessary fullness of the skirt. One night the young man I was dating and I went to the drive-in with another couple. We were in the back seat and I was probably wearing three of those underskirts plus a light blue cotton skirt with matching short-sleeve blouse. I stood the heat as long as I could, but I finally decided fashion was definitely subservient to comfort and I reached under my skirt and pulled off the underskirts and piled them on the floorboard. In those years of ingrained modesty, that was a bold move. My date, a young man with a great sense of humor from the deep south [Laurel, Mississippi], thought it was quite funny but still allowed me to maintain both my dignity and my reputation. All in all, I have to say, central heat and air is a definite improvement and an amenity I do not wish to forego – ever! I don’t recall hearing about the pitcher and it’s great to be able to see what that’s similar.